	Zensus, J. A., and T. J. Pearson. 1980. Superluminal Radio Sources. Cambridge: Cambridge University Press. Arp, Halton. 1997. Quasars, Redshifts and Controversies. Berkeley: Interstellar Media. Chu, S., and S. Wong. 1982. “Linear Pulse Propagation in an Absorbing Media.” Phys. Rev. Lett. 48, 738. Segard, B., B. Macke. 1985. “Observation of negative velocity pulse propagation.” Phys. Lett. A 109(5), 213-216. Crisp, M.D. 1971. “Concept of group velocity in resonant pulse propagation.” Phys. Rev. A 4, 2104. Mugnai D., Ranfagni A. and Ruggeri R., Phys. Rev. Lett. 80 (2000), 4830. Saari, P., and K. Reivelt. 1997. “Evidence of X-shaped Propagation-invariant Localized Light Waves.” Phys. Rev. Lett. 79 (21), 4135-4139. Besieris, I.M., Abdel-Rahman, M., Shaarawi, A.M., and A.A. Chatzipetros. 1998. “Localized pulse solutions of the scalar wave equation.” Prog. Electromagn. Res. 1-19. Saari P. 2000. “Superluminal localized waves of electromagnetic field in vacuo.” Paper presented at the conference “Time’s Arrows, Quantum Measurements and superluminal behaviour,” Naples, Italy, October 2-6. Enders, A., and G. Nimtz. 1993. “Zero-time tunnelling of evanescent mode packets.” J. de Physique-I, 3 (5), 1089-1092. Ranfagni, A., Fabeni, B., Pazzi, G.P., and D. Mugnai. 1993. “Anomalous pulse delay in microwave propagation: A plausible connection to the tunnelling time.” Phys. Rev. E 48, 1453. Spielmann, Ch., Szipocs, R., Stingl, A. and F. Krausz. 1994. “Tunneling of Optcial Pulses through Photonic Band Gaps.” Phys. Rev. Lett. 73, 2308. Steinberg, A.M., Kwiat, P.G., and R.Y. Chiao. 1993. “Measurement of the single-photon tunnelling time.” Phys. Rev. Lett. 71, 708. Nimtz, G., and A. Haibel. 2000. “Basics of Superluminal Signals.” Ann. Phys. (Leipzig) 9, 1-5. Brillouin L. 1960. Wave Propagation and Group Velocity. New York: Academic Press. Sommerfeld A. 1954. Optics. New York: Academic Press. Recami, E., 1998. “On localized X-shaped Superluminal solutions to Maxwell equations.” Physica A 252, 586-610. Ringermacher, H., and Mead, L.R., 2001. “Comment on Observation of Superluminal Behaviour in Wave Propagation.” Phys. Rev. Lett. 87, 059402. Lunardi, J.T., 2001. “Remarks on Bessel beams, signals and superluminality.” Phys. Lett. A 291, 66-72. Shaarawi, A.M., and Besieris, L.M., 2000. “On the superluminal propagation of X-shaped localized waves.” J. Phys. A Math. Gen. 33 (40), 7255. Arons, M.E., and E.C.G. Surdashan. 1968. “Lorentz Invariane, Local Field Theory and Faster-than-Light Particles.” Phys. Rev. 173, 1622. Dhar, J., and E.C.G. Surdashan. 1968. “Quantum Field Theory of Interacting Tachyons.” Phys. Rev. 174, 1808. Recami, E., 1974. “Monopoles and Tachyons.” Rivista Nuovo Cimento, 9 (6), 367-372 and references therein. Mignani, R., and E. Recami. 1973. “Tachyons do not emit Cherenkov radiation.” Lett. Nuovo Cimento 7, 388-390 and references therein. Recami E. 2001. “Superluminal motions? A bird’s-eye view of the experimental status of the art.” Found. Phys. 31, 1119-1135. Recami, E. 2004. “Superluminal tunneling through successive barriers. Does QM predict infinite group velocities?.” J. Modern Opt. 51, 913-923. Szabo, R.J. 2004. An Introduction to String Theory and D-brane Dynamics. London: Imperial College Press. Scharnhorst, K. 1990. “On propagation of light in the vacuum between plates.” Phys. Lett. B, 236 (3), 354-359. Chiao, R.Y., Kwiat, P.G,. and A.M. Steinberg. 1993. “Faster than light?.” Scientific American, August. Nimtz, G., and A.A. Stahhofen. 2007. “Macroscopic violation of special relativity.” arXiv:0708.0681v1. McLaughlin B. 2011. “Neutrinos and the Speed of Light-A Primer on the CERN Study.” Last modified September 26. http://www.wired.com/ geekdad/2011/09. Adam T., et al. 2011. “Measurement of the neutrino velocity with the OPERA detector in the CNGS beam.” http://arXiv.org/abs/1109.4897. Holzschuh, H., Fritschi, M., and W. Kundig. 1992. “Measurement of the electron neutrino mass from tritium-decay.” Phys. Lett. B 287, 381-388. Weinheimer, Ch., et al. 1993. “Improved limit on the electron-antineutrino rest mass from tritium -decay.” Phys. Lett. B 300, 210-216. Kawakami, H., et al. 1991. “New upper bound on the electron anti-neutrino mass.” Phys. Lett. B 256, 105-111. Wang, L.J., Kuzmich, A., and A. Dogariu. 2000. “Gain-assisted superluminal light propagation.” Nature, 406, 277-279. Forward, R.L. 1995. “Faster-Than-Light.” Analog Science Fiction and Fact, 115 (4), 1995, 30-50. Einstein, A. 1935. “An elementary derivation of the equivalence of mass and energy.” Bulletin of the American Mathematical Society 41, 223-230. Ignatowsi, W. V. 1910. “Einige allgemeine Bemerkungen zum Relativitatsprinzip.” Phys. Zeits. 11, 972 – 967. Torretti, R. 1983. Relativity and Geometry. Oxford: Pergamon Press. Brown, H. 2005. Physical Relativity: Space – time structure form a dynamical perspective. Oxford: Clarendon Press. Caligiuri, L.M., and A. Sorli. 2013. “Special theory of relativity postulated on homogeneity of space and time and on relativity principle.” American Journal of Modern Physics 2 (6), 1-4. doi: 10.11648/j.ajmp.20130206.25. Caligiuri, L.M. and A. Sorli. 2014. “Space and Time separation consequences on hypothetical Time Travel, Superluminal Motion and Big Bang Cosmology.” Journal of Cosmology, 18, 212-222. 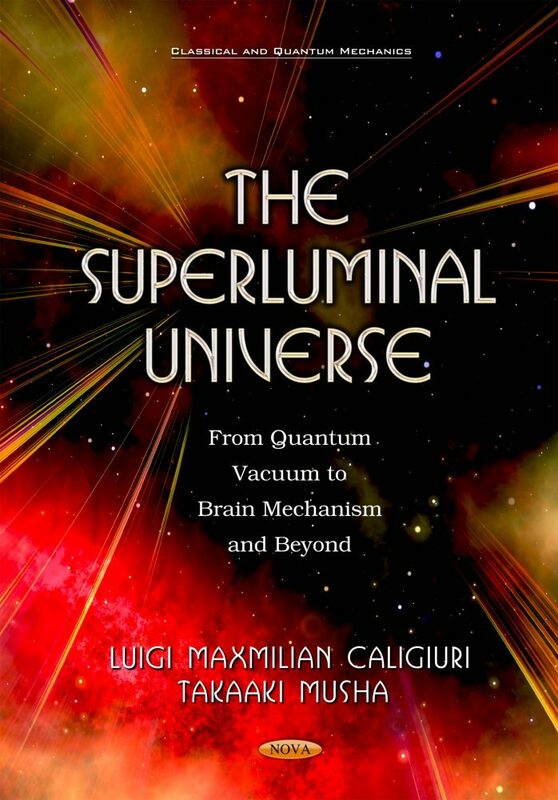 Caligiuri, L.M. and A. Nastro. 2014. About the conventionally of simultaneity and synchronization. Paper presented at the 20th IMEKO TC4 International Symposium and 18th International Workshop on ADC Modeling and Testing Research on Electric and Electronic Measurement for the Economic Upturn - special session Synchronization Service for Measurement and Monitoring, Benevento, Italy, 15 – 17 September. Einstein, A. 1988. “Ueber die spezielle und die allgemeine Relativitaetstheorie,” Vieweg, Braunschweig. Poincare, H. 1898. “De la mesure du temps.” Rev. Metaphys. Morale, 6 (1). Nelson, R. A., et al. 1993. “Experimental comparison of time synchronization techniques by means of light signals and clock transport on rotating earth,” paper presented at the 24th Precise Time and Time Interval Meeting. Selleri, F. 1995. “Space, Time and their transformations.” Chinese journal of Systems, Engineering and Electronics, Special issue on Space, Time and Motion – Theory and Experiment 6 (4), 25 – 44. Selleri, F. 1996. “Noninvariant one – way velocity of light.” Found. of Phys., 26 (5), 641 – 664. Caligiuri, L.M, and A. Sorli. 2014. “Relativistic energy and mass originate from homogeneity of space and time and from Quantum Vacuum energy density,” American Journal of Modern Physics 3 (2), 51-59. doi: 10.11648/j.ajmp.20140302.14. Dutheil, R. 1991. “About a Lorentz pseudo-group related with a topology.” Ann. de la Fondation L. De Broglie. 16 (4), 503-512. Hartman, T.E. 1962. “Tunneling of a wave packet.” J. Appl. Phys. 33, 3427. Hauge, E.H., and J.A. Stovneng. 1989. “Tunneling times: a critical review.” Rev. Mod. Phys. 61, 917. Landauer, R., and Th. Martin. 1994. “Barrier interaction time in tunneling.” Rev. Mod. Phys. 66, 217. Stahlhofen, A.A., and G. Nimtz. 2006. “Evanescent modes are virtual photons.” Europhysics Letters 76, 189–195. Nimtz, G. 2009. “On virtual Phonons, Photons and Electrons.” Found. of Phys. 39, 1346 and references therein. Longhi, S. et al. 2001. “Superluminal optical pulse propagation in periodic Bragg gratings.” Phys. Rev. E 64, 055602(R)(4). Zeilinger, A., et al. 1999. “Wave-particle duality of C60.” Nature. 401, 680, October 14. Marshall, I. N. 1989. “Consciousness and Bose-Einstein condensates.” New Ideas Psychol. 7, 73-83. Crick, F., and C. Koch. 1990. “Towards a neurobiological theory of consciousness.” Semin. Neurosci. 2, 263-275. Singer, W. 1993. “Synchronization of cortical activity and its putative role in information processing and learning.” Annu. Rev. Physiol. 55, 349-374. Penrose, R. 1989. The emperor’s new mind. Oxford: Oxford University Press. Penrose, R. 1994. Shadows of the mind, Oxford: Oxford University Press. Pribram, K. H. 1991. Brain and Perception. New Jersey: Lawrence Erlbaum. Jibu, M., et al. 1994. “Quantum optical coherence in cytoskeletal microtubules: implication for brain function.” BioSystems, 32, 195-209. Frohlich, H. 1968. “Long-range coherence and energy storage in biological systems.” Int. J. Quantum Chem., 2(5), 641-649. Popp, F. A. 1992. Recent advances in biophoton research and its application. Singapore, London, New York: World Scientific. Umezawa, H, 1993. Advance field theory: micro, macro and thermal physics. New York: American Institute of Physics. Davydov, A. S. 1979. “Solitons in molecular systems.” Phys. Scripta, 20, 387-394. Hameroff, S. R., and R. Penrose. 1995. “Conscious events as orchestrated space-time selections.” J. Consciousness Studies, 2. 98-111. Hameroff, S. R., and R.C. Watt. 1982. “Information processing in microtubules.” J. Theor. Biol., 98, 549-561. Del Giudice, E., Preparata, G., and G. Vitiello. 1988. “Water as a free electric dipole laser.” Phys. Rev. Lett., 61, 1085-1088. Georgiev, D.D. 2002. “Quantum computation in the neural microtubules: quantum gates, ordered water and superradiance,” arXiv:quant-ph/0211080. Mavromatos, N.E. 2011. “Quantum coherence in (brain) microtubules and efficient energy and information transport.” Journal of Physics: Conference Series, 329, 1-31. Caligiuri, L. M. 2015. “Zero-Point Field, QED Coherence, Living Systems and Biophotons Emission.” Open Journal of Biophysics, 5, 21-34. Caligiuri, L.M., and T. Musha. 2014. “Quantum Vacuum Dynamics, Coherence, Superluminal Photons and Hypercomputation in Brain Microtubules.” Paper presented at the 1st International Conference on Theoretical and Applied Physics, Athens, Greece, November 28-30. Caligiuri, L. M., and T. Musha. 2015. “Superradiant coherent photons and hypercomputation in brain microtubules considered as metamaterials.” International Journal of Circuits, Systems and Signals Processing, 9, 192-204. Caligiuri, L. M. 2015. “Tunneling of super radiant photons through brain microtubules modeled as metamaterials.” Paper presented at the 2nd International Conference on Rheology and Modeling of Materials, Miskoic, Hungary, October 5-9. Caligiuri, L.M., 2015. “Electronic QED coherence in brain microtubules.” WSEAS Transactions on Biology and Biomedicine, 12, 104-112. Preparata, G., 1995. QED Coherence in Matter. Singapore, London, New York: World Scientific. Del Giudice, E., and G. Preparata. 1998. “A new QED picture of water: understanding a few fascinating phenomena” in Macroscopic Quantum Coherence. Singapore, London, New York: World Scientific. Arani, R., Bono, I., Del Giudice, E., and G. Preparata. 1995. “QED coherence and the thermodynamics of water.” Int. J. of Mod. Phys. B 9, 1813-1842. Bono, I., Del Giudice, E., Gamberale, L., and M. Henry. 2012. “Emergence of the coherent structure of liquid water.” Water, 4, 510-532. Cifra, M., Pokorny, J., Havelka, D., and et al. 2010. “Electric field generated by axial longitudinal vibration modes of microtubules.” BioSystems, 100, 122-131. Del Giudice, E., and G. Preparata. 1994. “Coherent dynamics in water as possible explanation of membrane formation.” J. of Biol. Phys., 20, 105-116. Voeikov, V. L., and E. Del Giudice. 2009. “Water respiration: the basis of the living state.” Water, 1, 52-75. Del Giudice, E., Doglia, S., Milani, M., and G. Vitiello. 1988. “Structures, correlations and electromagnetic interactions in living matter.” Berlin: Springer-Verlag. Trepat, X., Deng, L., and S. An. 2007. “Universal physical response to stretch in the living cell.” Nature, 447, 592-595. Buzzacchi, M, Del Giudice, E., and G. Preparata.2002. “Coherence of the glassy state,” Int. J. Mod. Phys. B 16. Caligiuri, L. M., 2015. “The origin of inertia and matter as a superradiant phase transition of quantum vacuum.” In Unified Field Mechanics. Singapore, London, New York: World Scientific. Recami, E. 2001. “A bird’s-eye view of the experimental status-of-the-art for superluminal motions.” Found. of Phys. 31, 1119-1135. Recami, E. 2004. “Superluminal tunneling through successive barriers: does QM predict infinite group velocities?” J. Modern Opt., 51, 913-923. Stahlhofen, A. A., and G. Nimitz. 2006. “Evanescent modes are virtual photons.” Europhys. Lett., 76 (2), 189-185. Caligiuri, L. M., and A. Nastro. 2014. “About the conventionally of simultaneity and synchronization,” paper presented at the 20th IMEKO TC4 International Symposium and 18th International Workshop on ADC Modelling and Testing Research on Electric and Electronic Measurement for the Economic Upturn - special session Synchronization Service for Measurement and Monitoring, Benevento, Italy, September 15 - 17. Ziolowski, R. W. 2001. “Superluminal transmission of information through an electromagnetic material.” Phys. Rev. E, 63 (4). Nimitz, G. 2009. “On virtual phonons, photons and electrons.” Found. of Phys., 39, 1246-1355. Landauer, R., and Th. Martin. 1994. “Barrier tunneling time in tunneling.” Rev. Mod. Phys., 66, 217-228. Carniglia, C. K., and L. Mandel. 1971. “Quantization of evanescent electromagnetic waves.” Phys. Rev. D, 3, 280-296. Haibel, A., Nimitz, G., and A.A. Stahlhofen. 2001. “Frustrated total reflection: the double-prims revisited.” Phys. Rev. E 63, 047601. Longhi, S., Marano, M., Laporta, P., and M. Belmonte. 2001. “Superluminal optical pulse Propagation at1.5 μm in periodic fiber Bragg gratings.” Phys. Rev. E 64, 055602. Enders, A., and G. Nimitz. 1992. “On superluminal barrier traversal.” J. Phys. I, France, 2, 1693. Marcuse, D. 1973. “Coupled mode theory of round optical fiber,” B.S.T.J.,52 (6), 817. Caligiuri, L.M. 2014. “Supercoherence as result of ZPF dynamics,” submitted for publication. Feynman, R.P. 1999. Feynman Lectures on Computation. London: Penguin Books. Berman, G.P., Doolen G.D., Mainieri, R., and V.I. Tsifrinovich. 1998. Introduction to Quantum Computers. Singapore: World Scientific Publishing. Nielsen, M.A., and I. Chuang. 2000. Quantum Computation and Quantum Information. Cambridge: Cambridge University Press. Ben-Amram, A.M. 2005. “The Church-Turing Thesis and its Look Alikes.” SIGACT News, 3(13), 113-116. Smolyyaninov, I.I., Zayats, A.V., Gungor, A., and C.C. Davis. 2004. “Single Photon Tunneling.” http://arXiv.org/PS-cache/cond-mat/pdf/ 0110/0110252.pdf. Whipple, C.T. 2002. “Nano Switching in Optical Near-Field, Eye on Technology.” http://www.oemagazine.com/ from The Magazine/ mar02/pdf/eyeontech.pdf. Benioff, P. 1982. “Quantum mechanical models of Turing machines that dissipates no energy.” Physical Review Letters 48 (23), 1581-1585. Margolus, N., and L.B. Levitin. 1998. “The maximum speed of dynamical evolution.” Physica D 120, 188-195. Musha, T. 2006. “A study on the possibility of high performance computation using quantum tunneling photons.” Int. J. Simulation and Process Modeling 2 (1/2), 63-66. Jibu, M., Pribram, K.H., and K. Yasue. 1996. “From Conscious Experience to Memory Storage and Retrieval: The Role of Quantum Brain Dynamics and Boson Condensation of Evanescent Photons.” Int. J. Mod. Phys. B 10 (13/14), 1753-1754. Musha, T. 2005. “Superluminal Effect for Quantum Computation that Utilizes Tunneling Photons.” Physics Essays 18 (4), 525-529. Chiao, R.Y., Hickmann, J.M., and D. Soli. 2001. “Faster-than-Light Effects and Negative Group Delays in Optics and Electronics, and their Applications,” http://arXiv.org/abs/cs/0103014. Haroche, S., Raymond, J-M. 1996. “Quantum Computing: Dream or Nightmare?” Physics Today, 49 (8), 51-52. Gea-Banacloche, J. 2005. “Fundamental limit to quantum computation: the energy cost of precise quantum logic.” Mathematical Sciences 508, Tokyo, Saiensu Co. Ltd, 47-57. Musha, T. 2009. “Possibility of high performance quantum computation by superluminal evanescent photons in living systems.” BioSystems 96, 242-245. Jibu, M., Hagan, S., Hameroff, S.R., Pribram, K.H., and K. Yasue.1994. “Quantum optical coherence in cytoskeletal microtubules: implications for brain function.” Biosystems 32 (3), 195-209. Satinover, J., 2001. The Quantum Brain. New York: John Wiley & Sons, Inc.
	Albrecht-Buehler, G. 1992. “Rudimentary form of cellular vision.” Proc. Natl Acad Sci. USA, 89(17), 8288-8292. Hameroff, S., and J. Tuszynski. 2004. “Quantum states in proteins and protein assemblies: The essence of life?.” Paper presented at SPIE Conference, Grand Canary Island, May. Jibu, M., and K. Yasue. 1997. “What is mind? Quantum Field Theory of Evanescent Photons in Brain as Quantum Theory of Consciousness.” Informatica 21, 471-490. Jibu, M., Yasue, K., and S. Hagan. 1997. “Evanescent (tunneling) photon and cellular vision.” Biosystems 42, 65-73. Hameroff, S.R. 2001. “Consciousness, the brain and spacetime geometry.” Annals New York Academy of Sciences 929, 74. Hameroff, S.R., and R. Penrose. 1996. “Conscious Events as Orchestrared Space-Time entanglement Selections.” Journal of Consciousness Studies 3, 36-53. Hameroff, S.R. 1982. “Information Processing in microtubules.” J. Theor. Biol. 98, 549-561. Del Guidance, E., Doglia, S., and M. Milani. 1986. “Electromagnetic field and Spontaneous Symmetry Breaking Biological Matter.” Nuclear Physics B 257, 185-199. Vitiello, G. 1995. “Dissipation and memory capacity in the quantum brain model.” Int. J. Mod. Phys. B 9(8), 973-989. Faber, J., Portugal, R., and L.P. Rosa. 2006. “Information processing in brain microtubules.” Biosystems 83, 1-9. Tegmark, M. 2000. “Importance of quantum coherence in brain processes.” Phys. Rev. E 61, 4194-4206. Unruh, W.G. 1995. “Maintaining coherence in quantum computers.” Phys. Rev. A 51(2), 992-997. Hagan, S., Hameroff, S.R., and J. Tuszynski. 2002. “Quantum computation in brain microtubles: Decoherence and biological feasibility.” Phys. Rev. E 65, 061901-1-11. Hameroff, S.R., and J. J. Tuszynski. 2003. Search for quantum and classical mode of information processing in microtubles (Bioenergitic Organization in Living Systems). Singapore: World Scientific Publishing. Bialek, W., and A. Schweitzer. 1987. “Quantum noise and the Threshold of Hearing.” Phys. Rev. Lett. 54(7), 725-728. Musha, T. 2006. “A study on the possibility of high performance computation using quantum tunneling photons.” Int. J. Simulations and Process Modeling 2(1/2), 63-66. Hameroff, S.R. 2004. “A new theory of the origin of cancer: quantum coherent entanglement, centrioles, mitosis, and differentiation.” Biosystems 77 (1-3), 119-136. Diosi, L. 2005. “Instrict Time Uncertainties and Decoherence: Comparison of 4 models.” Brazilian Journal of Physics 35 (2A), 260-265. Ouyang, M., and D.D. Awschalom, 2003. “Coherence spin transfer between moleculary bridged quantum dots.” Science 301, 1074-1078. Penrose, R. 1999. The Large, the Small and the Human Mind. Cambridge: Cambrigde University Press. Baena, J.D., Jelinek, L., Marwues, R., and F. Medina. 2005. “Near-perfect tunneling and amplificationof evanescent electromagnetic waves in a waveguide filled by a metamaterial: Theory and experiments.” Phys. Rev. E 72, 075116. Bopa, B-I, and S.A. Cummer. 2006. “Direct measurement of evanescent wave enhancement inside passive metamaterials.” Phys. Rev. E 73, 016617-1-5. Del Giudice, E., Doglia, S., et al. 1988. “Structures, Correlations and Electromagnetic Interactions in Living Matter: Theory and Applications.” Biological Coherence and Response to External Stimuli. Berlin: Springer Verlag, 49-84. Feynman, R. P. 1999. Feynman Lectures on Computation. London: Penguin Books. Feinberg, G. 1967. “Possibility of faster-than-light particles.” Phys. Rev. 159, 1089-1101. Zurek, W. H. 2002. “Decoherence and Transtion from Quantum to Classical-Revisited.” Los Alamos Science 27, 86-109. Copeland, B.J., and D. Proudfoot. 1999. “Alan Turing's forgotten ideas in computer science.” Scientific American, April 1999, 99-103. Llyod, S. 2000. “Ultimate physical limit to computation.” Nature 406, 1047-1054. Musha, T. 2013. “Possibility of Hypercomputation from the Standpoint of Superluminal Particles.” Theory and Applications of Mathematics & Computer Science, 3(2), 120-128. Musha, T. 2012. “Possibility of Hypercomputation by Using Superluminal Elementary particles.” Advances in Computer Science and Engineering, 8(1), 57-67, also in “Possibility of Hypercomputation from the Standpoint of Superluminal Particles.” 2013. Theory and Applications of Mathematics & Computer Science 3 (2), 120-128. Park, M., Y. Park. 1996. “On the foundation of the relativistic dynamics with the tachyon.” Nuovo Cimento. 111B (11), 1333-1368. Smith, T. 2003. “Quantum Consciousness. Water, Light speed, and Microtubules.” http://www. innerx.net/personal/tsmith/ QuanCon2.html. Veselago, V. G. 1968. “The Electrodynamics of substances with simultaneously negative values of and .” Soviet Physics Uspekhi 10, 509 -514. Ung, B. 2009. “Metamaterials: a Metareview.” ww.polymtl.ca/ doc/art_2_2.pdf. Claus, R. O. 1990. “Noncontact Measurement of High Temperature Using Optical Fiber Sensors.” Final Report, NAG-1-831 (NASA-CR-186975) Virginia Polytechnic Inst. and State Univ., VA, USA, 40-50. Pribram, K. H., Nuwer, M., and R. J. Baron. 1974. “The Holographic Hypothesis in Memory Structure in Brain Function and Perception.” In Contemporary Development in Mathematical Psychology. ; Atkinson, R. C.; Krantz, S. H.; Luce, R. C.; Suppes, P., Eds. ; W. H. Freeman & Co., San Francisco, USA, 416-467. Jain, K., and G. W. Jr. Pratt. “Optical transistor.” Appl. Phys. Lett. 28, 719-720. Jain, K., and G. W. Jr. Pratt. 1983. “Optical transistors and logic circuits embodying the same.” U.S. Pat. 4,382,660, issued May 10. Kieu, T. D. 2004. “Hypercomputation with quantum adiabatic processes.” Theoretical Computation Science 317, 93-104. Penrose, R. 1994. Shadow of the Mind, A Search for the Missing Science of Consciousness. Oxford: Oxford University Press. Penrose, R. 1999. The Large, the Small and the Human Mind. Oxford: Oxford University Press. Jibu, M., Pribram, K.H., and K. Yasue. 1996. “From Conscious Experience to Memory Storage and Ritrieval: The Role of Quantum Brain Dynamics and Boson Condensation of Evanescent Photons.” Int. J. of Mod. Phys. B 10 (13/14), 1753-1754. Del Giudice, E, Doglia, S. and M. Milani. 1986. “Electromagnetic field and Spontaneous Symmetry breaking in Biological Matter.” Nuclear Physics B 275, 185-199. Seto, A., Yamamoto, T., Nakazato, B., and T. Hisamitsu. 1995. “Influences of Consciousness on the Quantum Random Process in Electron Transition.” Paper presented at the Symposium of the Institute of Kanazawa, 95, The Japan Society of Applied Physics (autumn 1995). Wickramasinghe, C. 2011. “Bacterial morphologies supporting cometary panspermia: a reappraisal.” International Journal of Astrobiology 10 (1), 25–30. Napier, W. 2011. “Exchange of Biomaterial Between Planetary Systems” (PDF) 16. pp. 6616–6642. Rampelotto, P. H. 2010. “Panspermia: A promising field of research.” Astrobiology Science Conference. Abs 5224. Boardman, M.J. 2013. “A conjecture on quantum horizontal gene transference, entanglement, and transport.” Journal of Space Exploration, 2(3), 195-206. Calleman, C.J. 2009. The Purposeful Universe. Rochester: Bear & Company. Haisch, B., Rueda, A., and Y. Dobyns. 2001. “Inertial mass and quantum vacuum fields.” Ann. Phys. 10 (5). Jammer, M. 2000. Concept of Mass in Contemporary Physics and Philosophy. Princeton: Princeton Univ. Press. CMS Collaboration. 2012. “Observation of a new boson at a mass 125 GeV with the CMS experiment at the LHC.” Phys. Lett. B 716 (17), 30-61. Haisch, B., Rueda, A., and H.E. Puthoff.1994. “Inertia as a zero-point-field Lorentz force.” Phys. Rev. A 49, 678. Rueda, A., and B. Haisch. 1998. “Contribution to inertial mass by reaction of the vacuum to accelerated motion.” Found. Phys. 28, 1057-1108. Rueda, A., and B. Haisch. 1998. “Inertia as reaction of the vacuum to accelerated motion.” Phys. Lett. A 240 (3), 115. Rindler, W. 1994. “The Lense-Thirring effect exposed as anti-Machian.” Phys. Lett. A 187, 236-238. Dobyns, Y., Rueda, A., and B. Haisch. “The case for inertia as a vacuum effect: a reply to Woodward and Mahood.” Found. Phys. 30 (1), 59. Caligiuri, L. M. 2015. “The origin of inertia and matter as a superradiant phase transition of quantum vacuum.” In Unified Field Mechanics. Singapore, London, New York: World Scientific. Del Giudice, E., and G. Preparata. 1998. “A new QED picture of water: understanding a few fascinating phenomenon” in Macroscopic Quantum Coherence. Singapore, London, New York: World Scientific. Xing-Hao, YE, and L. Qiang. 2008. “Inhomogeneous vacuum: an alternative interpretation of curved spacetime.” Chin. Phys. Lett. 25 (5), 1571-1574. Caligiuri, L. M. 2014. “The Emergence of Space-Time and Gravity: Entropic or Geometro-Hydrodynamic Process? A Comparison and Critical Review.” Quantum Matter 3 (3), 249-255. Sakharov, A. D. 2000. “Vacuum quantum fluctuations in curved space and the theory of gravitation.” General Relativity and Gravitation 32 (2), 365-367. Bohm, D., and J. P. Vigier. 1954. “Model of the causal interpretation of quantum theory in terms of a fluid with irregular fluctuations.” Phys. Rev. 96, 208. Mitchell, W.C. 1997. “The Big Bang theory under fire.” Physics Essays, 10 (2), 370-379. Iljjas, A., Steinhardt, P.J., and A. Loeb. 2013. “Inflationary schism after Planck 2013,” Phys. Lett. B 723, 261. Musha, T. 1998. “Possible existence of faster-than-light phenomena for highly accelerated elementary particles.” Speculations in Science and Technology 21, 29-36. Recami, E., and R. Mignani. 1974. “Classical theory of tachyons (special relativity extended to superluminal frames and objects),” Rivista Nuovo Cimento 4, 209-290. Recami, E., and R. Mignani. 1974. “Classical theory of tachyons,” Rivista Nuovo Cimento, 9 (6), 4-159 and references therein. Caligiuri, L.M. “Coherent quantum dynamics of ZPF and superluminal interactions,” in preparation. Musha, T. 2009. “Thermal Radiation Generated Inside The Sun due to the Cherenkov Radiation from ZPF Field.” Far East Journal of Applied Mathematics, 37 (2), 229-235. Anderson. L.H. 1989. A Physicist’s Desk Reference, Second Edition of Physics Vade Mecum. New York: American, Institute of Physics. Musha, T. 2001. “Cherenkov radiation from faster-than-light photons created in a ZPF background.” Journal of Theoretics, 3 (3), 1/7-7/7. Fang, LZ, and LS Xian. 1988. Creation of the Universe. Singapore, London, New York: World Scientific. Tomaschitz, R. 1999. “Cosmic tachyon background radiation.” Int. J. Mod. Phys. A, 14 (27), 4275-4285. Coles, P., and G.F.R. Ellis. 1997. Is the Universe Open or Closed ?, (Cambridge Lecture in Physics), Cambridge: Cambridge University Press. Starkman, G.D, and D.J. Schwarz. 2005. “Is the Universe out of tune?.” Scientific American, 293 (2), 36-43. Mitchell, W.C. 1995. The Cult of the Big Bang (Was There a Bang?). Carson City, Nevada: Cosmic Sense Books. Waves from the Big Bang. 2014. http://www.nature.com/news/b-mode-1.14884. Caligiuri, L.M. 2015. “Plasma universe cosmology, electric charge and coherent quantum vacuum dynamics.” Journal of Space Exploration, 4 (1), 11-17. Dutheil, R., and B. Dutheil. 1992. L’homme superlumineux. Paris: Sand. Hari, S.D. 2010. “Eccles’s Mind Field, Bohm-Hiley Active Information, and Tachyons.” Journal of Consciousness Exploration & Research, 1 (7), 850-863. Sheldrake, R. 1988. “The Presence of the Past: morphic resonance and the habit of nature.” New York. Caligiuri, L.M. and A. Nastro. 2014. “About the conventionally of simultaneity and synchronization.” Paper presented at the 20th IMEKO TC4 International Symposium and 18th International Workshop on ADC Modeling and Testing Research on Electric and Electronic Measurement for the Economic Upturn - special session Synchronization Service for Measurement and Monitoring, Benevento, Italy, 15 – 17 September. Prigogine, I., and G. Nicolis. 1977. Self-Organization in Non-Equilibrium Systems. Hoboken: Wiley. Caligiuri, L.M. 2015. “Zero-Point Field, QED Coherence, Living Systems and Biophotons Emission.” Open Journal of Biophysics, 5, 21-34. doi: 10.4236/ojbiphy.2015.51002. Bohm, D., and B.J. Hiley. 1993. The unidivided Universe: an ontological interpretation of Quantum Theory. London and New York: Routledge. Gonzalez-Mestres, L. 1996. “Cosmological implications of a possible class of particles able to travel faster than light.” Nucl. Proc. Suppl. 48, 131. De la Pena, L., Cetto, A. M., and A. V. Hernandez. 2015. The Emerging Quantum, New York: Springer-Verlag. De la Pena, L., and A. M. Cetto. 1996. The Quantum Vacuum: An Introduction to Stochastic Electrodynamics. Dordrecht: Kluwer Acad. Publ. Audience: Research Scientists; Professors, Students, Universities, Research Institutions, Industries and Laboratories working on Artificial Intelligence, Quantum Optics and Information, Material Sciences, Informatics, Biophysics, etc.